In Nomine Patri, et Filii, et Spiritu Sancti, Amen. 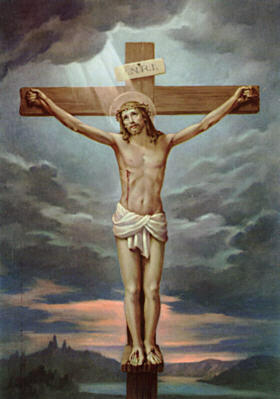 Credo in Deum, Patrem omnipotentem, Creatorem coeli et terrae; et in Iesum Christum, Filium eius unicum, Dominum nostrum: qui conceptus est de Spiritu Sancto, natus ex Maria Virgine, passus sub Pontio Pilato, crucifixus; mortuus, et sepultus. Descendit ad infernos; tertia die resurrexit a mortuis; ascendit ad coelos, sedet ad dexteram Dei Patris omnipotentis; inde venturus est iudicare vivos et mortuos. * Credo in Spiritum Sanctum, Sanctam Ecclesiam Catholicam, Sanctorum communionem, remissionem peccatorum, carnis + resurrectionem, vitam aeternam. Amen. Pater Noster, qui es in coelis, sanctificetur nomen tuum: adveniat regnum tuum: fiat voluntas tua, sicut in coelo, et in terra. * Panem nostrum quotidianum da nobis hodie: et dimitte nobis debita nostra, sicut et nos dimittimus debitoribus nostris. Et ne nos inducas in tentationem, sed libera nos a malo. Amen. Ave Maria, gratia plena; Dominus tecum; benedicta tu in mulieribus, et benedictus fructus ventris tui, Iesus. * Sancta Maria, Mater Dei, ora pro nobis peccatoribus, nunc et in hora mortis nostrae. Amen. Gloria Patri, et Filio, et Spiritui Sancto. * Sicut erat in principio, et nunc, et semper, et in saecula saeculorum. Amen. I believe in God, the Father Almighty, maker of Heaven and earth. And in Jesus Christ, His only Son, our Lord. Who was conceived by the Holy Ghost, born of the Virgin Mary, suffered under Pontius Pilate, was crucified, died and was buried. He descended to Hell. On the third day, He ascended to Heaven. He is seated at the right hand of the God the Father Almighty, and from there here shall come to judge the living and the dead. I believe in the Holy Ghost, the Holy Catholic Church, the Communion of Saints, the forgiveness of sins, the resurrection of the body, and life everlasting. Amen. Hail Mary, full of Grace, the Lord is with thee. Blessed art thou amonst women, and blessed is the fruit of thy womb Jesus. Holy Mary, Mother of God, pray for us sinners, now and at the hour of our death. Amen. 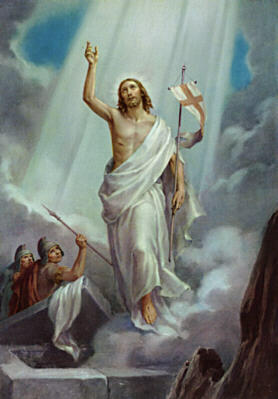 1 Mysteria Gloriae - Resurrectio Iesu Christi. O mei Jesu, Dimitte me et Salve me ex ignis Infernos. Perduc in Caelos omnis tener animas praesertim illos inops plurimus. 1 Glorious Mystery – The Resurrection of Jesus Christ. O my Jesus, Forgive me and save me from the fire of Hell. Lead all poor souls toward Heaven, especially those who are most in need. 2 Mysteria Gloriae - Ascensio Iesu Christi. 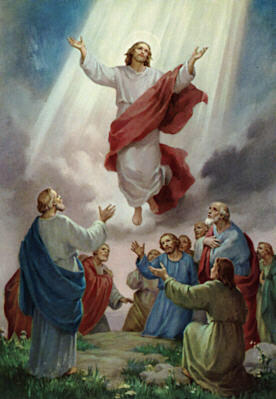 2 Glorious Mystery – The Ascension of Jesus Christ. 3 Mysteria Gloriae - Spiritus Sancti supra beatam Mariam Virginem et discipulos descensus. 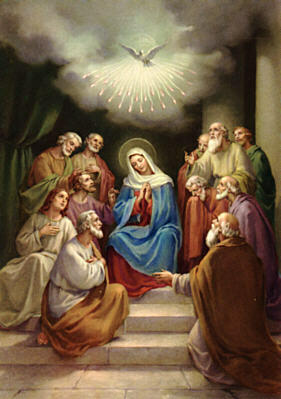 3 Glorious Mystery – The descent of the Holy Ghost upon the Virgin Mary and the disciples. 4 Mysteria Gloriae - Assumptio beatae Mariae Virginis in caelum. 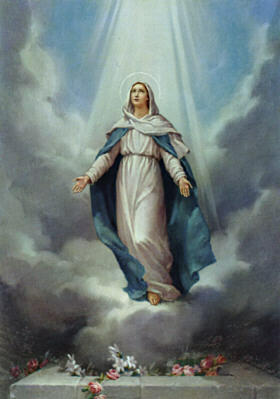 4 Glorious Mystery – The Assumption of the Virgin Mary into Heaven. 5 Mysteria Gloriae - Beatae Mariae Virginis coronatio itemque Angelorum et Sanctorum gloria. 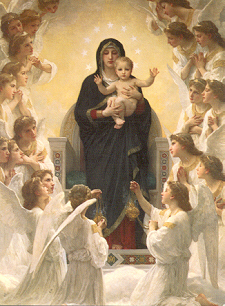 5 Glorious Mystery – The Coronation of the Blessed Virgin Mary, Queen of Heaven. 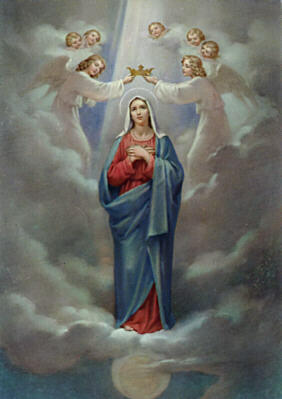 Hail Holy Queen, Mother of Mercy; our life, our sweetness and our hope. To thee do we cry, poor banished children of Eve. To thee do we send up our sighs, mourning and weeping, in this valley of tears. Turn then, most gracious Advocate, thine eyes of mercy towards us, and after this our exile, show unto us the blessed fruit of thy womb, Jesus. O clement, O loving, O sweet Virgin Mary. R> That we may be made worthy of the promises of Christ. 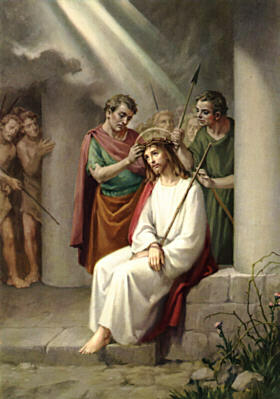 1 Mysteria Dolorum - Iesus Christus, in horto orans, sanguinem sudat. 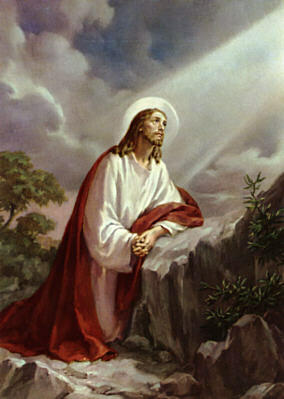 1 Sorrowful Mystery – The Agony in the Garden. 2 Mysteria Dolorum - Iesus Christus ad columnam flagellis caeditur. 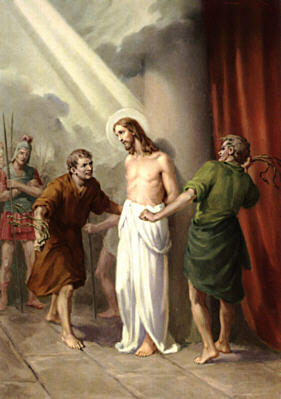 2 Sorrowful Mystery – The Scourging at the Pillar. 4 Mysteria Dolorum - Iesus Christus, morte condemnatus, Calvariae locum, crucem baiulans, petit. 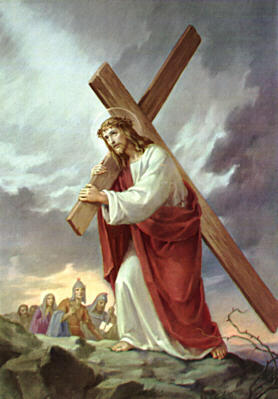 4 Sorrowful Mystery – The carrying of the Cross. 5 Mysteria Dolorum - Iesus Christus, cruci affixus, coram Matre sua moritur. 1 Mysteria Gaudiorum - Beatae Maria Virgo ab Angelo salutatur. 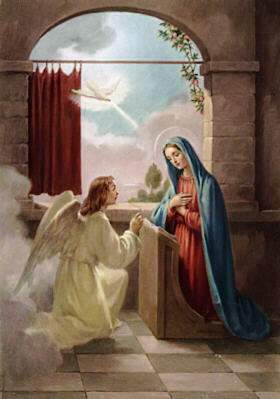 1 Joyful Mystery – The Annunciation. 2 Mysteria Gaudiorum - Beatae Maria Virgo Elisabeth visitat. 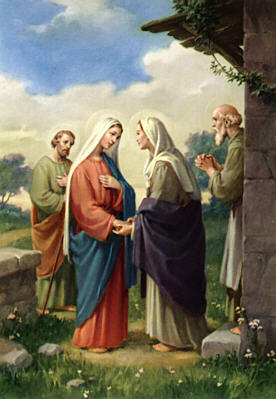 2 Joyful Mystery – The Visitation. 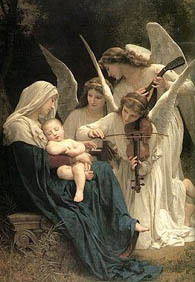 3 Mysteria Gaudiorum - Iesus Christus in Bethlehem nascitur. 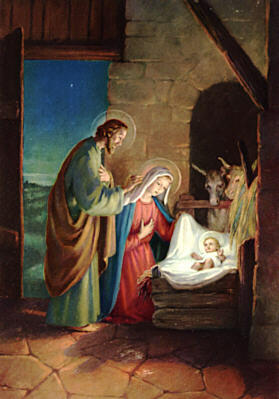 3 Joyful Mystery – The Nativity. 4 Mysteria Gaudiorum - Iesus infans in templo praesentatur. 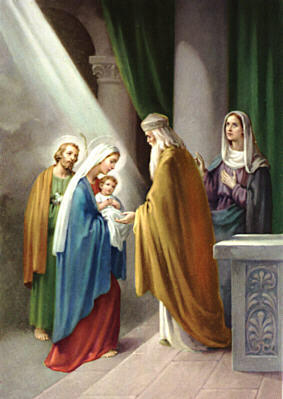 4 Joyful Mystery – The Presentation of Jesus in the Temple. 5 Mysteria Gaudiorum - Iesus puer in templo inter doctores invenitur. 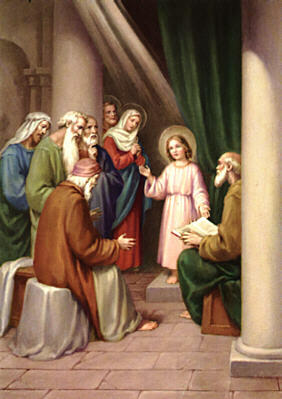 5 Joyful Mystery – The finding of our Lord in the Temple.